The philosophy of Danny Rizkallah, is to introduce healthy Village like cuisine from the Mediterranean basin , like Lebanon, Greece and Cyprus. Also to promote local artists by giving them a chance to exhibit in his restaurants. "I grewup in Lebanon and Canada, since French is the native language of Quebec, transitioning to Nice is easy as far as the language goes. I have lived in many different countries, actually and the last 4 years of my adulthood spent in Lebanon, Beirut. That city is vibrant and has an amazingly sophisticated nightlife, yet the city of Nice is very similar to the city of Beirut,"he says. "Every 2 months I exhibit and work with a artist in showing their talented work in the studio restaurant. The problem artists everywhere in the world have is that the big galleries only want well known artists and the smaller young artists have a difficult time finding a good space. The event every 2 months is a big one here and we have grand openings for each artist. And yes, of course, the guests can come and eat the food!" "I guess the one thing to say about the restaurant is that it is BIO and 100% Vegan and Vegetarian. That is very important and yes I do have wine and the wine is French wine. That is important to me and to the guests. The bread that I make is traditional Lebanese flat bread and I buy from the local Baker the gluten free bread everyday. And it is very healthy. Okay, I do have desserts," Danny jokes,"Yet, they are not necessarily fattening. It is a healthy chocolate!" He says. I do not know if I am to believe him yet the chocolate tastes so good in between the SAJ bread that I justify eating a healthy portion of it! The soup is Lebanese, as is the 4,000 year old traditional flat bread that is named, SAJ, as is the restaurant, and Danny makes the bread himself every morning. "I make about 3 kilos in the winter and about 6 kilos in the summer! The people in Nice love the SAJ bread and the tourists know Lebanese food. The only tourists, such as you, who think that Lebanese food is Morroccan food is the Americans! "he jokes with me and I say that is true and that is why we need to educate the American people to the tastes of the culture of Lebanese food. "Yes working as a consultant should of seemed more difficult, yet my second career as a first time restaurant owner is actually more physically demanding since I come into the SAJ in the morning and stay working all day. Yet, it is fun for me. I have made many friends who love to know me and my culture and I love the Nicois people and the French people. It has given me a chance to meet many people from around the world. The one thing I love is the food of Lebanon and since I am Lebanese, I really enjoy cooking everyday. Eventually, I guess I shall teach and hire people to cook at SAJ, yet for now in my first year it is something that I love to do for me. It is relaxing, too." he says laughing when I ask if working in the corporate world is harder than owning a boutique restaurant in the French Riviera! "Ultimately I wish the guests to come in and taste the food. I love the Nicois people and enjoy meeting every culture around the world." He says. Just to let you know I had the soup and the spinach and feta cheese and loved it! You shall fall in love with the French for a couple of reasons; they do as they say and stand up to any sight they see if a injustice is upon then, they are 100% individualistic which is different than independent and they see tha world as French in a Globalistic World which translates to they are open to hearing the World's Views and making these French! Having said that please come to Nice, France and especially to El Merkado where the twin of Tom Cruise owns the swanky yet totally at ease original cocktail bar and tapas restaurant, the boss is named Cedric! "You know I only sip champagne once in awhile and my friends think it is funny since I own a bar!" "Yet it has it all; with the best variety of homemade bitters, top of the shelf vodkas and Gins and very high quality healthy tapas, plus the adults act like kids and play the games all night. We're very close to the sea and the center of the city and at night we always have a lively house here. You should come try a cocktail tonight!" and I say I shall! "We have a bartender's original cocktail named the WEED paradise which comes with relaxing weed although it is legal and guests love it; and I have top shelf Vodka from Japan many of these and top quality liqours which is probably why thay named us the Best, BEST, bar in Nice!" laughs Ludo who proudly wears his New York Baseball Cap as he makes me his special Latte Caramel Macchiato in the morning. 12 Rue Saint-François de Paule "I am Italian and French, own a Spanish tapas and cocktail bar in Nice, France, and it is a bar with original drinks that we have exclusivity on," says Cedric. "Tapas, Chili, Chicken Wings, huge salads," Cedric says and when I interrupt and ask if any food on the menu is French he laughs giggling, "um, no, sorry, yet some of the cocktails they are from French bartenders and the tons of games we have for the guests to play are French." Located right in the middle of Nice near the sea, with a gorgeous ambiance, friendly and happy bartenders and great interactive games to play with friends and strangers-if you come in alone and want to join people playing games that is alright too! "As you can see formal people love to have fun too!" "Real French ingredients," says the young daughter, Karine, who's father is the Maestro, Marcel. "I went to Switzerland to study Culinary School and when I came back to Nice I opened my first restaurant which to my high standards was a disaster!" laughs Karine. 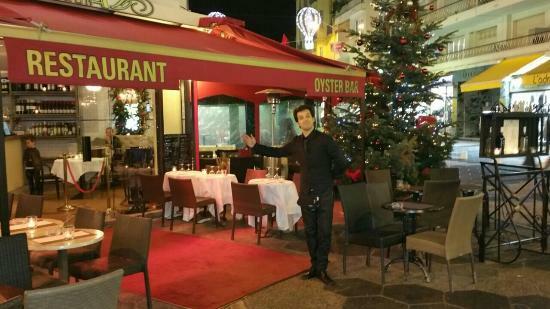 "My father had many famous restaurants in Nice and after the 3 years of my first, I asked if he wanted to try with me. He said yes and we started the plans for Le Grand Balcon. I admired the great interior designer, Jacques Michelis, who has designed luxurious places in Paris and Monaco to name a few; and one day I am sitting in Nice and I am talking to a guest about how I love that designer and he introduces himself! I couldn't believe it is him! I said that I wished he would design my restaurant yet I am not rich like the big hotels, and he rushes with me hand in hand to the restaurant and laughing says YES!" says Karine! The restaurant is her vision and his and is beautiful. "Years later, I asked him to design the Marcel restaurant named after my father and surprisingly he said yes again!" And although Karine says that the Bistro Marcel and it's presentation of the homemade French food is the way her grandmother would make at home, I can tell you honestly my grandmom doesn't make food that looks like this! You can see the reason why below that I love the Bistro; it is simply beautiful. "Yes and it is a typical French restaurant having the frog legs and Foie Gras terrine; as I said, prepared lovingly the way my grandmother or my father would prepare the food at home. The freshest ingredients and a real French meal." And the Bakery? "O yes that is the newest addition to my 3 family of restaurants. That one is named after my grandfather," says Karine when I ask her if that one is named after her! "No, I guess I am more like my father since I would prefer to stay in the shadows and create. I love to create and yes I do know how to cook if they Chef never shows up, yet creating 10 hours in the kitchen isn't my idea of a creative life!" she says. "My grandfather came from Italy and he brought the first bakery of Italy to Nice. I though it only fitting to make a bakery, yet a French one, of course, with his name." 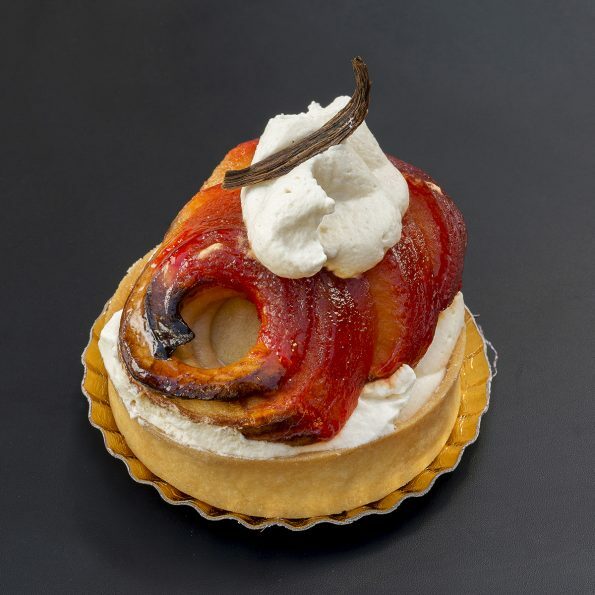 Alright the Jeannot pretty much speaks for itself, with fattening desserts that you definitely want when you go to a French bakery, with some cool surprises! "In Europe we call fussball or table football, Babyfoot and here at my place I have 2 Babyfoots as you enter and the little snacks and the Playstation room where people can play the games and 2 Babyfoots in the last room. I am a champion Babyfoot player and have a trophy from Lyon, actually." says Vedran who is born in Yugoslavia. Here he is winning the championship and has a trophy such as you receive at the Oscars; speaking of which, I ask if I can print a new script to bring to the Cannes Film Festival to show. He has printing services and the printing is excellent, by the way, if you would love to use his cyber services. located at: au 27 Rue Tonduti de l’ Escarène. "The cafe is open from 12:00pm to 21:00pm and the young highschool kids come in every day to play during lunch. The Babyfoot tables are fun and they can spend 5.00euros and play one hour. I opened it because I have two interests, Babyfoot and Extreme Sports of Bike Riding. It is a place to come when your work is finished and relax one hour or the young people that are 15 to 45 come in with friends and play Babyfoot. I would say I have snacks such as french fries and a couple of vegan burgers and vegan sandwiches, yet you really come here to play Babyfoot. That is the real reason people come, honestly." says Vedran. "Sodas are 1.50cents; no drugs; no alcohol. It is a healthy clean place to play games." Just how fast are the Babyfoot pros? Very fast! If you are visiting Nice as a tourist please bring your family to play Babyfoot and PlayStation and hear French all around you, and if you plan on partying out in the city of Nice at 22:00pm, you should try a little Babyfoot in the afternoon to unwind. 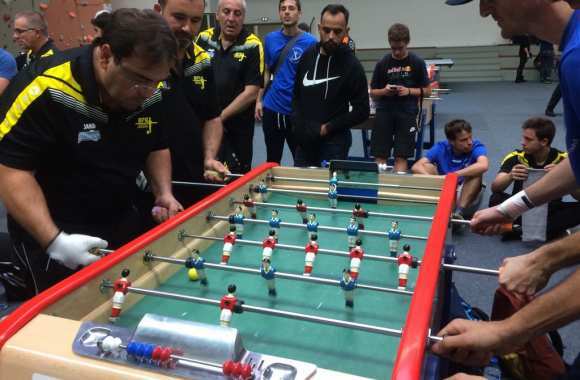 "They have maybe 1,000 real competitive Babyfoot pros in France, which if you compare it to Tennis or Football is very little; however, people do the Babyfoot because it is their passion. They love to have fun and do competition in a unharmful way. Safe and fun. I hope you have many interested visitors that come to try it. The best in the world play 4 hours everyday and I only play a couple of hours learning one techinique of back and forth, yet I trained in Babyfoot the last 5 years and am very good at it." says Vedran. 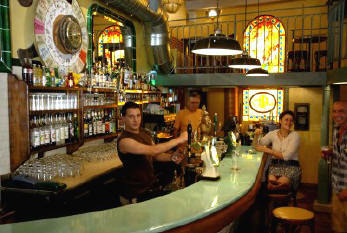 Where can I find a real comfortable yet swanky and bohemian bar in Nice? You ask...try at the harbor where in addition to the great view of real cool and very big yachts, you can have professional bartenders who have won many awards in flair and mixology serve you great drinks. The atmosphere is gorgeous and friendly and the people very interested in you! "And the food is exotic too, such as Barbajuan Epinard, Jalapeno Farcis Ricotta lard, Calamars Frits or some Thai food of Bowl Poulet, we try to have high quality of ingredients with original presentations. And at brunch we have a menu that you can choose from and try a original cocktail." says Guillaume. Although they try new ones every time, here is a list of today's cocktail menu, such as the Royal Elixir with Espuma Vanilla, Chambord, Citron jaune, Sirop de Vanille maison, Gin: yum, or how about Avocado Lovers with Rhum Sailor Jerry and Liqueur de banane, Creme d'avocat! "I love my cocktail bar and let's see we named it Darwin since it is always a evolution. The cocktails are always changing. Right now we make our own syrups and we make our own liqueurs such as Coffee liqueur and Tobacco liqueur. We have ingredients to make about 500 of our signature cocktails. That is why I opened the bar. I want it to have a reputation as a cute bar where people can come and have a conversation and the lady can sit at the bar and sip a cocktail. We do have some wines, yet the cocktails are the most important to the guests. It isn't a beer guzzling bar, although my friends own one of these!" says the very happy and charming Guillaume who is only 24. "The art of showmanship is called Flair and the Mixology is the art of the actual mixing of the cocktails. Me and Romain, my very good friend who helps me to make the cocktails, are in a competition of France in a couple of days. Honestly, you need a great mixologist for the guests to drink the cocktails!" he says, "yet they would much prefer to drink a cocktail if you add a little flair to it." says Guillaume. Here he is showing his talent of "flair"
"I can say that while I do miss the elegance and sophisticated atmosphere of the 4 seasons, where I am the youngest bar manager at any 4 Seasons in the World, I love my bar. I try to bring that respect and yet playfulness to my bar that the 4 Seasons trains each person to do," he says. "I learned much from the expertise and experience of everybody working there such as the Michelin 1 and Michelin 2 star chefs." O and did I mention they are right at the Port Yacht harbor! Now that is lovely...and although we are becoming known for the cocktails, we have food too!" says Guillaume, the young 24 year old owner of the swanky cocktail bar Darwin. On Sundays we have brunch from 12.00 pm to 5.00pm. I love the cheese and meat plates with a nice bottle of wine and sparkling or still water, since I eat the cheese too fast and it gets stuck, cheese, water, wine! The chic streamlined modern French wine bar and restaurant is new to Nice; although the young entreprenuer is a experienced hospitality professional, ¨I worked in Monaco at a prestigious hotel where the Prince of Monaco came for important events and even served the Prince a couple of times. He is such a nice person and everybody loves working for him; essentially if you work in Monaco, you work for Prince Albert,¨says Mickael. His long friend is Jean Matthieu and is hilarious. The cook, Jordan, giggles constantly from the kitchen, yet his presentations are exquisite. ¨Alegria means Joy in French, Italy, English, Spanish...it is a word that everybody can relate to, and we have much joy here and we named it Alegria,¨they say. "If you want to try homemade roasted fresh meats here is your restaurant." says the happy owner, Joseph of La Rossettisserie in Nice France's cool local alleys. I loved walking the little pathways at night seeing all the people and everyday I have seen the restaurant with laughing happy tourists. "We give the locals and the tourists the same homemade cooking. Since I buy the meat fresh everyday from the local boucherie, I can tell you that the meat comes from France, England, and Italy. That is mostly where it comes from. It is always the best and they always have lines waiting to buy from the boucheries. From here we bring it to the La Rossettisserie and roast the meat that day. I hope when you come to try the restaurant, the service and the meat that you will see how good it is." he says as he invites me to dinner. I of course say yes. I want to try the famous Nice chicken that everybody talks about. It is very cozy and a beautiful restaurant with a basement for guests and a upstairs dining room. The little red and white checkered tables outside and the dining room inside give a very homey feeling and are totally comfortable, with laughter always. "The La Rossettisserie is very provincial and we only have fresh homemade roasted meat. 100% of the food here is fresh meat that I buy from a couple of boucheries down the alley, the most famous in Nice. " says Joseph, as he shows me the chalkboard with the selections written on it; the special meat of the day is always 15.50euros and the other meats always only 16.50euros which is pretty darn good for dinner, especially Nice and especially homemade fresh meats. Today's special happens to be Filet Mignon of Pork! written by me! "The restaurant is on 3 levels of about 60 to 65 people and we have the outside tables in addition that people in the summer love to sit at. We serve only homemade food and it is very provincial, a little menu of only select meats everyday and a little restaurant, see provincial" laughs the happy Capo who is very human and jokes a lot. "When you come here you will have a real home cooked meal of Provincial France. I wouldn't say it is Nicoise, yet it is French. We do love to eat chicken in France, yet mostly in the Spring and Summer and Autumn...not the winter. And yes when you try my chicken it is very tasty and very soft. It is a very different French experience." he says. The meats include roast lamb, 1/2 chicken, roast beef, roast veal, roast pork, and filet mignon of pork. 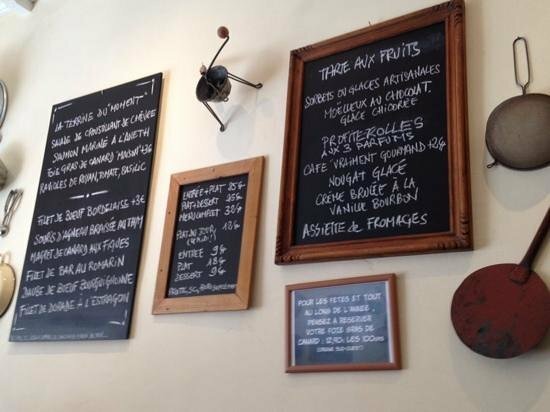 The recipes are 100% homemade of a family atmosphere and very traditionally french. 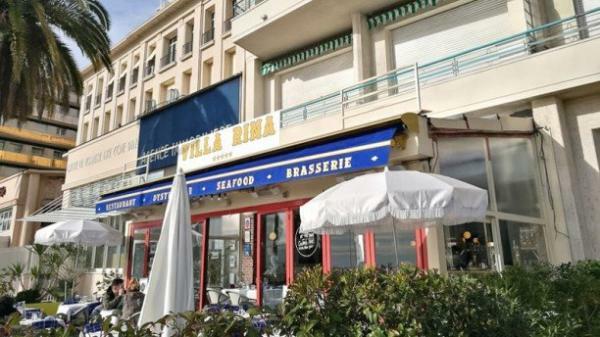 "You can come to lunch and dinner now yet starting in June we're only open at dinner since the tourists and residents of Nice love going to the beach. And since I love going to the beach, you can find me at the beach in the summer during the day. You know we love to have a good life and yet I don't want to make money money money and have a huge yacht of 51 meters and have to surround myself with cooks and captains and deck guys tending the yacht. I want a nice little boat, which I have that goes with my nice little restaurant. It is a nice life." he says. Me personally, the restaurant is the epitome of my idea and vision of a Provincial French bistro, although La Rossettisserie is classified as a restaurant. 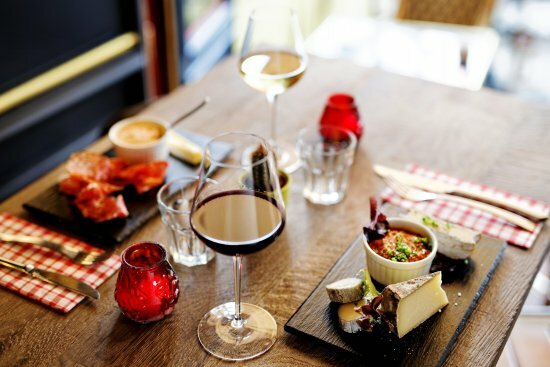 It has the beautiful architecture with the stone walls and the wooden wine and liquor crates and the red and white checked tableclothes, the overall picture of what a French restaurant should look like; however it is the real thing and I loved the fun atmosphere and solid feeling I had in it. It has a lot to do with the owner, who is a very normal and happy guy named Joseph. Let me give you an example..."I have Filet Mignon of Pork today, yet my waitress girl isn't here today so I can't write it." he says and when I ask if he wants me to write it for him, he laughs and lets me write on the chalkboard. I ask if it is alright and he says yes that is great. Very provincial. Loved it. 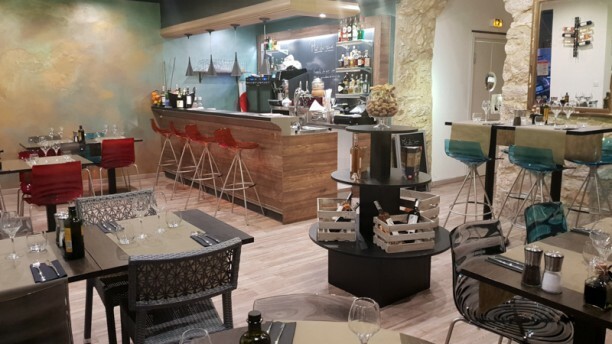 You will have a lovely dinner at Alegria where the team with the Boss Mickael smiles and laughs with Joy as the name suggests and they are always kind. Always. I had such a fun night talking to the team and mostly laughing. ¨I am happy that the guests love to joke with us. They do it all the time.¨he says. I say that they do that since they are surrounded with such a talkative curious team. That joy spreads throughout the restaurant wine bar the minute you walk in they give you a old fashioned ¨HAPPY DAYS¨ candy jar and Jean Matthieu starts singing the theme song to the show. The boss Mickael is very gracious and keeps thanking me for writing about his restaurant. I found the Alegria charming, elegant and lovely light food. True. And the wine! Yum. ¨Yes, well I gave you the best to try. Want more? ¨he asks as I drink all of it in 15 minutes chatting slowly to him. And honestly I could drink all the wine yet I know I have to write his article so I only drink one glass. ¨Do you want to see the desserts?¨asks Mickael and of course I say yes. Beautiful homemade tarts that are available from ¨9:00 am to Midnight and the chef is here from 11:00 am til 2:00 pm and 7:00 pm til midnight. However if you want to come and have coffee and a light dessert in the morning please come to meet me. We want beautiful presentations with modern twists; yet we want the best ingredients. It does not have perfection on earth, yet we try to offer you the best.¨he says. ¨We want the reputation as the best and the freshest ingredients. We want people to come here for that and the finest wines. We try to be as professional and gracious as we can and we want people to feel at home here yet as if they are experiencing a special night. That is ultimately the goal to achieve the best.¨ And social media? ¨Okay,¨Mickael laughs, ¨Now we have a photographer taking pictures and we start the social media. We want the restuarant to be up to par in terms of our presentations before we start showing off Jordan and his food!¨he says. ¨Yes, it has elegance and sophistication and that design is due to Mickael and his vision and the Italian architect who choose the cool modern lights and colors. We are very unpretentious nice people that laugh all the time and have total fun with the guests, and I, personally, am as unsnobby as they come. I love people who are kind and honest and appreciate the effort I try to give to my guests and Mickael is that way. We found and hired the chef since he is young, talented and enthusiastic. You hear him laughing all the time in the kitchen. He tries new items and he lets us taste and we eat it all, yet we want it to be the best for the guests. The fish is the freshest since we are both nice guys and we know the contacts, the local fisherman gives us the fish. I would say that we have the best fish in Nice,¨says Jean Matthieu. Shanthi is the very charming INDIAN WOMAN WHO IS THE BOSS OF THE SOUTH indian CUISINE of THE INDIAN LOUNGE in Nice FRANCE located at 34 rue Droite...and along with her son, Hariharan who testifies to the loving and caring qualities of his mom by saying , "I don't like when she works since I want her to spend more time with me taking a coffee or having a nice day with me," and a colleague, Aathithya, I got to interview her. Not without interruptions, though, as a college film crew swarmed in to do a James Bond movie in the restaurant as we spoke! BEAUTIFUL...MUST COME. "The food is South India, from the region where I come from, which is very different in terms of the people and the food. We're much more friendly and famous for hospitality." she says. Shanti is beautiful, playful and gracious, "The first reason the people come in is the beauty of the colors and the intimate and romantic lighting of the restaurant. When they meet us they say they love the atmosphere and they try the food and they come a couple of days to eat here." says Shanthi. "The cool thing about my boss is she is all about hospitality. She worked here the last couple of years from 2012 to 2014 and at that year she actually bought the restaurant. It is a Southern Indian place and most restaurants that are Indian are northern, yet India is known for its colors and its warmth everywhere. Especially the south. And in India the entire family is taken care of from the mother. My boss takes care of the restaurant and the feeling of walking into her home and she takes care of her own family. She is amazing and the common thing about everyone who eats at the Indian Lounge is that they all say how welcoming that they felt upon entering and eating here." says Hariharan. "The first thing that I did is go out and buy lights and colorful lush decorations for my restaurant. It is all me when you walk in. And of course I work with the chef to introduce him to my original recipes," says Shanthi. "I am very hands on and every morning I come to work at about 7.00 to 10.00 am and make the sauces for the main dishes. My chef knows which meats and fish go with the sauces and we work well together. Yet I love my restaurant and it is definitely a reflection of the care that I have put into it the last couple of years," says Shanthi. The place is stunnigly beautiful with "lamps and statues and colors of fabric that I have the last 3 to 4 years have added in my travels to India, Indonesia, and Bali, in turn to shop for decorations the way I would decorate my home," says Shanthi. "The South Indian culture is known more for vegetables and rice and seafood. The food that we serve isn't necessarily spicy, either, although all and all the the Southern Indian food is more spicy than the North Indian food." says Aathithya, "and me, personally, I love the spicy food!" Yes I do too! Okay the Craze of Gourmet Burgers has arrived in Nice, actually about 1 year now with the only 12.40 total Burger, Fries, Drink package! It is great! You can actually come to meet Arnaud, who is the owner, while he rushes around preparing the burger, which, by the way, is 100% French beef, 100% bread from a local Nice bakery, 100% local vegetables, 100% potatoes from Lille France, etc. The burgers are pure beef, not processed. You can feel innocent bringing your kids here! While we laugh and point out our favorite burgers, mine is the DARON, and Michael's is the Roquefort Cheese one, Michael interprets, "I have known my friend for a long time now, and he wants to say that the ingredients here are the freshest. The reasons people come to the Le Burgers de Papa are, 1. The food is fresh, the burger's handmade everyday, the sauce's recipes made as you order the burger, the vegetables from the local mercato, the potatoes hand sliced everyday to make the fries, 2. The service is friendly and everyday, as you see Arnaud jump up and run behind the counter to help the guests immediately, they care most about the guests that come here first, 3.The price is right...12.40 to 12.90 for each specialty burger with homemade real potatoe fries and a drink. At least 3.00 euros to 10.00 euros less than any other specialty burger. That is important." says Michael. And when I ask why does he come here? " I love the food!" he says. "The gourmet burger has entered the field and we do very good!" they say. "The reason is that people nowadays want to eat quality food. We have only quality food. Yes it is fattening. That is true, yet it is real burgers, real potatoes and real homemade sauce and vegetables with local French bakers. It is better to eat a fattening meal here!" I ask Arnaud's interpreter and friend, Micheal Lilong, who is a real estate agent in Nice, why the franchise from the north of France, named it "Papa". "I don't know, I guess it is because they are big burgers, yet it says, in the entire quote, "I want my Mama,"" he says. "Everyday the locals come to try the burgers, and interesting to me is that in France, at least, they love the fresh meat of the French beef. The young college kids come and the tourists have started to find us. It is a great business, honestly that is why I bought the franchise, yet it has become tons of fun for me and my team and now it has turned into a fun day for me everyday. My family is important and I have twins and they LOVE the milkshakes!" he says. 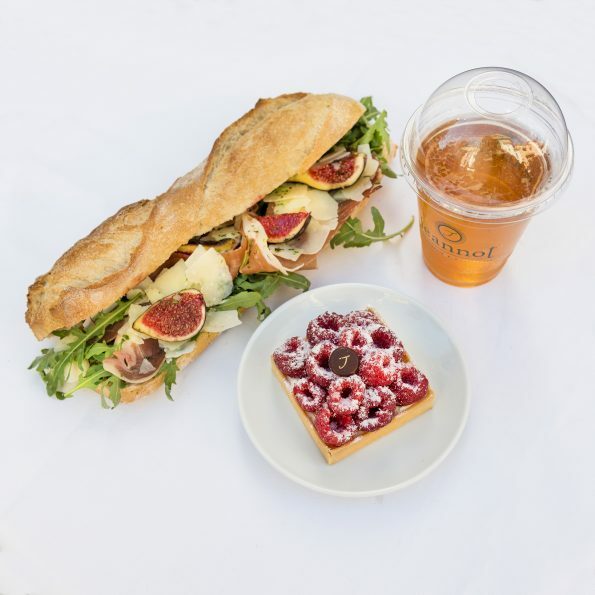 Le 7 eme Sens takeaway gourmet homemade food in Nice located at 10 rue Tondutti de l'Escarene. When Gilles first introduced himself as Gilles, I panicked. Since my main project is EmmeAnesBook, I have had many opportunities to do other projects, yet the one I wrote is the script named "the life of Albert". I had invited maybe about 65 company ceos to come to Nice France to produce the script and one of the champagne companies, cosmetic companies, fashion companies, etc CEO was Gilles! Yet I couldn't for the life of me remember which one! I kept asking him for his champagne label! "Here it is. A grand one and a tiny one." he says. I sighed with relief! Alright, Gilles is a real chef of a real homemade restaurant, and now we do a EmmeAnesBook interview! "I use only homemade products, such as chickens from farms only. They run around and you have to catch them!" he says. Hint...be prepared to LAUGH A LOT when you talk to him! Come here today and ask me to make a dish for you and if I have the ingredients, I do. Everyday is a new item. The fish here is expensive. Why? Since we are in Nice and the fish is from the sea. We catch it and eat it. And I filet it myself. That is important. I do it all. I do the display case. I take the fresh items. I cook it. I present it to you. I have fresh apple pie and new items everyday. And I box it up and you take it with you. That is important too. I can do that." says Gilles. restaurant named Le 7 eme Sens...! "I had a restaurant in Paris for 7 years and moved it to the city of Nice. At that time we had 26 seats and now since 2 years we have take away and if you want to have a bottle of wine and champagne here you can. You can stand and maybe about 10 to 12 people sit and eat and laugh about life and talk." "You can ask my guest eating the chicken what she thinks of it." says Gilles. I do and she says that it tastes very differently than normal chicken. "It is tender and soft and heavenly. The chicken from the farm is very different than normal chickens." she says as she is put on the spot! Hmm...I must taste that chicken, I say. "The most important thing to say about the tiny boutique restaurant is that the ingredients are all fresh and the food is all homemade and handmade with my own hands. I do it. I do it all. From the painting on the walls with the help of my son, Enzo, to the old-fashioned antique cooking tools that I display, to the tables and chairs and of course the food. Most importantly is the food. I am here. I stand here everyday and if you ask me to do a food, I do it." "You know we only have bottles of wine to compliment your gourmet lunch or dinner, yet if they want to stand here they can share a bottle of the best wine, or champagne and eat and drink while they talk. That is the way we do it here. Let's say 5 tourists came in tonight at 6.00pm. They grab some of the freshest food, they place it on the little bar and buy a bottle of red wine and they stand and sit at the bar and eat together. The place is very provincial. I planned it that way. I want the French people to come in here and see the cooking tools that grandmother and grandfather cooked with. It brings memories to each other. The tourists come to Nice on vacation to experience the real French culture." says Gilles with the help of Enzo! And I say that my people would LOVE it here! And you must meet Gilles who is so charming it is amazing. He kept freshing up for his pictures! You can stand at the cozy chic wooden bar that "I made myself. It is all my creation!" says Gilles, and talk and chat with the Chef as he prepares the dinner and drink the great wine! 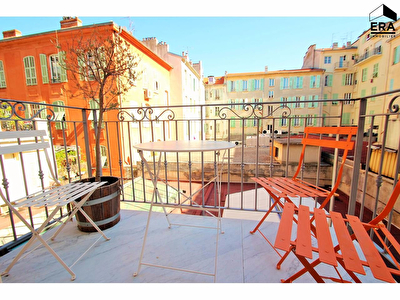 A big heartfelt thankyou very much to Michael Lilong who is a real estate agent at ERA in Nice France. "You know, I spent 10 years in New York with opening real French restaurants. I always remember a couple of lessons New Yorker's taught me. One is on my first day I had salad Nicoise on the menu. A diner was opposite the street. My salad, as I am new to New York, had canned tuna on it. A New Yorker sits at my table, takes it and shoves it toward me. Aggressively. He says to me, " If I wanted canned tuna, I could of gone to the Diner. You say that you are from France? Is that what you want me to believe?" Trust me, I was embarrassed since of course all that is said is true. I should of been better. The next day I bought real tuna, and I had seared tuna filet on my salad Nicoise from now on. Guess what? The price of my salad is let's say $18.00 and the diner's? $10.00. They all came and ate my salad Nicoise and I learned my lesson. Yet it wasn't a gentle lesson since you know it is New York." he says very humbly. "Yet, my quality since that day one has been the highest that I can find. Always. And I have never been embarrassed again. It was a good lesson." Alberto Rina is super nice. Even his commercial neighbors say that he is super nice. Believe me, I asked. He has a great story, too. A lovely life here in Nice and a sweet wife and family. Plus two great restaurants, one sandwiched in between the Hard Rock Cafe and next to the Tourism Office! Okay how can a guy be that lucky! I shall tell you. "Obviously we have great seafood since we are right on the Mediterrenean. And yes I do know how lucky I am, yet, I have worked 10 long years learning the best of the best and I now give my knowledge to my guests. The seafood is from the sea right here. It is as fresh as you can be without you diving in the water yourself!" he jokes. The team is super nice especially at the Villa Rina right on the promenade, which they wouldn't have to be nice I say since it is such a beautiful place and everybody would come here anyway to eat. "My team is nice and I believe that the reason people come to a restaurant is the way people are greeted and treated. And of course the food has to be edible!" he says laughing. "I owned very nice French restaurants at 44th and 8th Avenue and 45th and 8th Avenue. The New Yorkers LOVE French Restaurants. It is true, if it is French they come to it. Yet, if you are in New York it had better be very special French Restaurants. Honestly in New York my chef was Mexican! Yes it is true, yet very good!" he starts laughing. I say that I love Mexicans. "Yes I know yet here in Nice they are French. My team is French and my Chef's they are French. That is important to me. 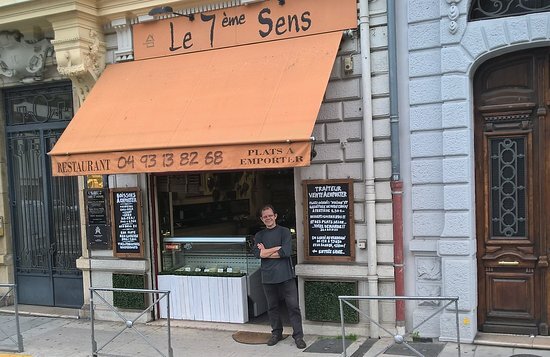 Yes I want the tourists to feel physically comfortable, yet I believe that they come to Nice to eat real French food that is cooked by a French chef." he says. I agree. 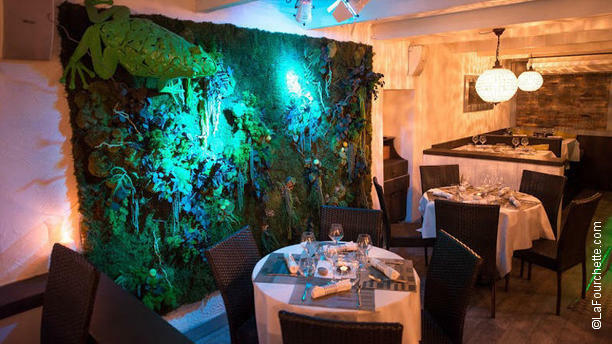 13 rue Massanet and is "charming in its combination of French Food yet a New York bistro that makes tourists feel comfortable. For instance, I have the brick interior and the bar is definitely shaped after a New York style as the decorations, and wait til you see my Villa Rina that is on the Promenade. That is stunningly beautiful with a cool oyster bar in the back and a little more expensive since as my wife says, you have the views of the yachts. Actually that is one of the arguements my wife made when we moved back to Nice. One day we see the Staten Island Boat traveling and my wife, who is French, turned to me and said, " Do you want to see beautiful yachts and the sea everyday from the windows or a big boat taking people to Staten Island! She is right. We came back to Nice!" he says laughing. The adorable puppy and kitten pet store where for a mere tiny 950.00 and above you can own and love a pet for life! In Nice! It has great happy hour everyday from 6pm to 8pm and great conversation of all ages. I don't know if it is because there are many locals here, or if it is the age old worn floors and adornments that make it such a cozy place, but I love to have a glass of wine every night here! Maybe it is the team, in the end, that make me happy to walk in the door since everybody is smiling and greets you and says hi and the team are always super friendly. Always. Les Distilleries Ideales where the real locals come, real business deals are signed, and the tourists laugh with loving the conversations that they have with the French. I met Taxil, Jocelyn,and her husband,Jean at the Michelin rated restaurant named Le Frog as I had wandered down the little alley from my favorite real provincial bar named Les Distilleries Ideales. I walked in and am graciously given access to Jocelyn and Jean, as they sat down to eat dinner at the lovely Michelin restaurant. She gave me a cool French lesson on the real traditional French food and as I am awaiting dinner they gave me a lovely steak and as much white wine as I could drink! Loved. I asked Jocelyn to explain the French cuisine to me. 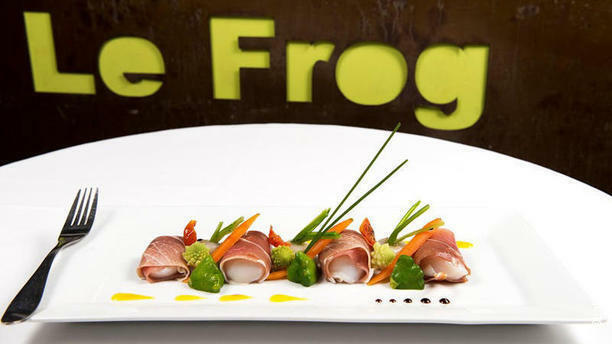 "Frog legs and Escargot are typical french items, as well as the Duck that we have on the menu. We have octopus salad and seasonal products such as the French Onion Soup that is only in winter. We have the special beef from the French farmers only and the fresh fish from the Mediterranean. " is French." Alright, isn't it of interest to learn that I have been taught the basics of the French culture and its food from a Michelin restaurant! And such a lovely and simple teacher is the owner! Gracious and smiling at me in such a forgiving way as if I am a little faux pas urchin wandering in from a Spanish tapas bar named El Merkado! 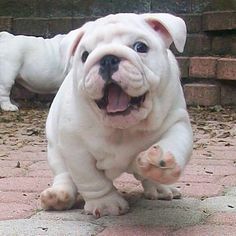 O hey wait I am! "My two people that it took me about 3 weeks to train, it is difficult to train a new person how to cook the Socca since it has to be in a 500 degrees oven and it has to be crispy on the outside and soft on the inside, are Yann and Maugan. They have been here about 5 years now. The Stone brick ceilings and arches are a added bonus for me since they are from the 19th century and very beautiful. I added the additional 2 rooms about one year now, yet I wanted to keep the historical beauty and so I designed it exactly industrial style. Everybody thinks the industrial bar and tables and bar stools have been here forever since it matches the original rooms and that is the effect I wanted. Now families come and play with their children in the rooms here while drinking a glass of wine or beer and wait one hour for Socca in the summer. Before they had to stand outside and wait one hour. 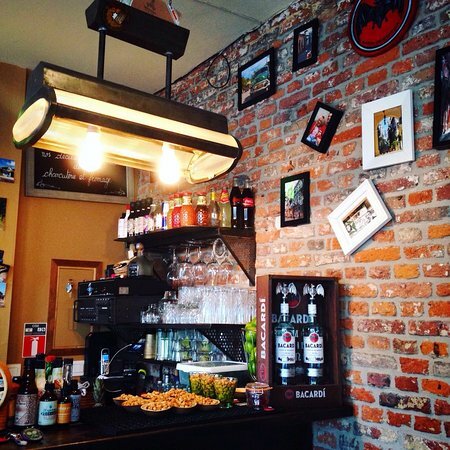 Now it is more of a bar area where you can eat Socca, too." says Steven as he shows me the different rooms. Gorgeous place, yet Socca is way too cheap. 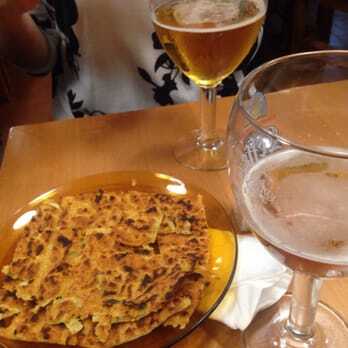 "Yes you can each have your own Socca and a couple of beers or a bottle of wine and at the most you will spend about 12.00euros to 20.00euros per person. The Socca itself varies from the classic, which you loved, of 2.80 euros to the stuffed with anchovies of 4.90 euros. It is very inexpensive and if you want classic pizza with carmelized onions on top, that is under 3.00 euros. It is a beautiful cozy atmosphere that is less expensive than fast-food for example, yet it is a must of the Riviera where some people that live here don't even know what it is. You must try it." he says and I eat the entire Socca! The traditional Socca ovens, similiar to the Italian pizza ovens are set at 500 degrees! "I especially love my house wine which is a Chateau Reva , a Rose, and very delectable," says Steven as he gives me a glass, and hands the bottle to his waiter who proceeds to pour 4 glasses for another table. The Rose wine flys off the shelf and soon everybody is drinking bottles of Rose wine. A old man wanders in to the room and starts telling me in a accent of French and Italian how he was born in the restaurant here at Socca 77 years now and that he has eaten Socca everyday for 77 years. He says that he is from Piedmont originally and that he has eaten pizzas and socca and that the socca is much better than pizza. He says he loves the wine and starts shuffling back to a strong wooden table to eat the socca and drink a couple of glasses of wine with his friends. Steven just laughs and nods. "Yes a lot of the locals come in everyday. The tourists are starting to find us and it makes me smile when I saw trip advisor the other day and a tourist from America wrote, it is a lovely food that is and isn't pizza and worth the trip to Nice. We ate Socca a couple of days when we finally found it and it is a must on the Riviera. That makes me happy." he says as he proudly shows me the review. I hope that my writing gives him many lovely guests. "Basically, I bought Chez Pipo because I love to eat Socca and it is very healthy too, it is naturally Gluten-Free since it's base is Chick peas and the Socca recipes of specialty Socca that we have are all vegetarian. 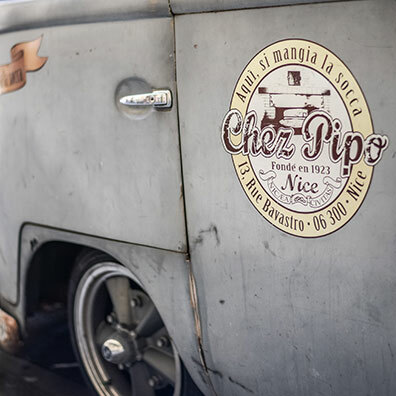 When the original owner opened it in 1920s, his name was Pipo and when we as people from Nice say let's go out we say let's go to Chez. Chez means to see our people. So, you are in a sense saying let's go to the house of Pipo, to Pipo's people." says Steven, the very young person who owns Chez Pipo the last 10 years. Stephane owns Bay Side and La Havana in Nice France and has a VERY WILD LIFE to bounce from. "I owned La Havana 17 years now and loved the Latin culture, to begin with and thought alright how aobut a Cuban place. It has Creole style food and Cuban Food and I mix the French culture with the Cuban." he says. "About 5 months ago, the place next door was for sale and they thought of putting a Kabob Place in or some sort of fast food and I said that no I wanted a classy place next to mine and to save the image of La Havana I bought the restaurant here and made it into a Elegant Wine bar. WE have cheeses and meats and classic French wines and it is very cozy and sophisticated. It has been opened 1 and 1/2 months and due to the fact it is behind the water I named it Bay Side since it is on the bay." he says. It is comfortable in the Wine Bar, too and the wine is very good! "I wanted a wine bar that had great wine, of course, and a variety of fresh provincial fresh food products such as the cheese and meat from the region of local farmers. We don't have a full service kitchen here, and of course, since it is France, we are still waiting for the outside tables, yet here we are! A cozy, more romantic place here where you can enjoy a quiet evening with friends. Next door is a little more lively, yet we are in a residential type setting and we have to keep the music low. I play whatever I want to play in terms of music, too." says Stephane. Does he miss the wild outdoorsy adventures? "Sometimes! "he says. Nice is my newest addition, and honestly, I have always loved the French peole having had Paris on 8 years now, however, the French are well how do we say? French! Here at the funky more American think New York Village or as the owner, Henri says, "I went to San Francisco and fell in love with the industrial side of America with the Craft beers and came back and we opend Beer District at 12 via emmanuele here in Nice." "Me and Paul took a couple of months redoing the interior, as most people do when they buy a new place, and made it very industrial, and very fun. We have beer games, we have music nights and we have sports nights and we love events so if you have a event let us know. We are learning.If you ask about the physical bar, the steel bar is ours, the chalk written descriptions on the blackboard everyday is our idea to make people feel comfortable asking about foreign beer, the heavy industrial bar stools are ours; yet if you see the skateboard on the walls and some of the decorations, you will notice that these come from the breweries themselves as gifts-the skateboard is from a American company. I am young, 28 and Paul is 24. We have been opened only 10 months now, and I am learning and honestly for me to have gifts from companies in America is a big thrill, from all the breweries, in fact and we are like, ALRIGHT!" "When I wanted to learn English, I went to summer camp in North Carolina near Greensboro and I became a cook and made American breakfasts of omelettes and pancakes and scrambled eggs. I loved America and I learned about the Craft beers for the first time, and later went to San Francisco and found more culture of craft beers. When I came back to america I asked my friend Paul if he wanted to try the craft beers and we both said yes. Now you ask if I am happy? Yes and the reason you can tell if I am not happy we wouldn't do this any longer." he says. People who know me know that all they have to do is look to the right to see my response...here is the picture of why I love the capos or patrons or bosses of Beer District, straightening behind the bicycle...all you have to do is love Albert and it is alright with me. "I love the bar and we are learning everyday and honestly when we first opened the first month is crazy like o sh--! we ran out of beer, and where do we find new breweries and how do we change the tap lines, and now it is as if we have too many requests and all the beer companies want to come in and we love it. Yes it is a learning process and it took about 5 months to figure out how to not have stress attacks every second. We are open everyday except Sunday and on most days we stay open to midnight and 1/2. We do have music nights and sports nights, yet it is a industrial area and the residents insist on us keeping the noise down. We turn up the music and close the doors and have fun talking about the beer." says Henri. 13 Rue Cassini, 09 522 69 910. The boys, Henri and Paul waiting for the crowds of people. "The people that come to the section here, which is very near the Harbor, are a mixture of locals and tourists and they very rarely are pretentious. They are happy to feel comfortable in the Pub we named Beer District and they love to ask us about the beers. As a matter of fact, the French are very used to Champagne and wine yet beer is a different story. They always ask us about the beer. Where does that one come from? Is it sweet, or bitter or deep or etc. I know every beer and I am very happy to tell about my beers. We have 16 on draft from around the world and about 70 bottles that we carry everyday. When a keg runs out, as today when you met the brewery guys from Toulouse, the new keg comes in. We had, of course, to taste many glasses today to make sure it is alright!" laughs Henri. I met Henri and the 2 brew masters today and as always, they are very happy, very casual and very simple.